2014 has been an amazing year for Pop Culture - and equally great for fans of all things merchandise. Whether it be vinyl toys, action figures or high end figures and statues, there's been a lot of lovely toys to buy, much to the chagrin of our wallets! 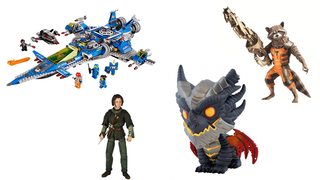 Here's some of our favourite Toys of the year. 2014 can perhaps be really defined by one thing: The Year of the Funko Pop. These adorable vinyl figures have been big for a while, but this year they've become truly one of the biggest markets on the planet, with licenses for everything from World of Warcraft to Cthulhu to X-files and Frozen all being transformed into figures this year. Funko might actually run out of properties to license for these guys in 2015, because they're showing no signs of stopping. Lego have had a great year - not just from amazing sets like the Batman Tumbler or the Simpsons House, or their other licensed lines trotting on from strength to strength, as well as amazing modular sets like the Parisian Restaurant, but with the kick off of The Lego Movie and its accompanying products. Our favourite? Why of course, Benny's Spaceship Spaceship SPACESHIP! Hasbro's Star Wars Black Series kicked off last year, but this year it's really come into its own. We've had two waves of the 6 inch toys this year, and they've brought us some great characters, including Darth Vader, Chewbacca, and of course, the Stormtroopers. I own two of them, and they're some of the best action figures I've ever owned - simple, yet packed with detail that's come to be the Black Series' hallmark. Here's to more from Black Series in 2014. Movie Black Widow finally hit Marvel's line of 6 inch toys this year, and it was worth the wait. This figure was badass through and through, and even came with two heads so you could have her as she appeared in either The Winter Soldier or The Avengers. Excellent! Lego's community-based crowdsourcing product Ideas (formerly known as CUUSOO) has come on bounds this year too, giving us this amazing Ghostbusters set just in time for the anniversary. Well worth noting separately from the rest of Lego's output. Comic Con always brings great exclusive toys to buy, but the best of the best at SDCC this year has to be the ReAction series Alien Egg Chamber playset. So wrong, yet so right - and a perfect accompaniment to what is still the best franchise to get the retro-toy treatment. Funko hasn't just been all about Pop Vinyls this year though - they've launched a line of six inch toys as part of the Legacy Collection, kicking off with Game of Thrones and even giving us Magic The Gathering and Book of Life toys too. The first wave of Game of Thrones toys had some quality issues, but the second wave that recently released - including fan favourites Jamie, Robb, Arya, 'Mhysa' Dany and Brienne - have been a step up into a great line of figures. Guardians of the Galaxy was our favourite movie of the year - and its merchandise has been just as fun. There's been some troubles (a teeny amount of Gamora and Nebula toys, and despite James Gunn's best interest, no worthy Dancing Groot), but the Marvel Legends Infinite series that gather the whole team, as well as Nova and Iron Man, was absolutely brilliant. Although they're not out until 2015, the revelation of Hot Toy's acquisition of the Star Wars License was one of the biggest bits of Toy news of the year. We've been tempted by Han and Chewie, by Stormtroopers, and everyone's favourite Bounty Hunter too already. Our Wallets are not ready for 2015. That's not to say 2014 hasn't been good for Hot Toys though either - they've had plenty of cool releases in 2014, but one of the best has to be this incredible collection featuring Bruce Wayne, Alfred Pennyworth and the Batman Armour from The Dark Knight. So amazing it'd make your wallet's eyes water if they had any. Star Trek fans may not have had a movie or big toy ranges to get excited about this year, but they got treated royally by QMX with this incredible Artisan recreation of the NX-01 Enterprise. As gorgeous as it was expensive, and with more Trek ships on the way from them, it's a great and pricey time to be a Trek collector. Oh, you know he had to be on this list. The last few months of 2014 have been enough to turn the whole year into the Year of Dancing Groot - and as Funko's is the first to actually have come out, it gets the honour of capping off our year, even separate from the cavalcade of Pop! Vinyls. We wanted him from the moment we laid eyes on him, and there's only going to be more Grooty goodness in our future. All hail Groot!